Plans have been approved for a major housing scheme at the former St George’s Hospital in Morpeth – but concerns remain about access. The scheme for up to 375 properties, including 112 affordable units, was approved on a majority decision at last Thursday’s Northumberland County Council north area planning committee meeting. The application included full planning permission for the first phase of the scheme, which involves demolishing five existing buildings and 11 cottages and building a mix of 119 properties. Outline permission was also given for a second phase, the demolition of two buildings to be replaced by up to 115 dwellings, and a third phase – the construction of up to 141 homes. Access to the development will be via the junction of the A197 and Dark Lane. The county council said that the access as it currently exists is capable of accommodating the traffic movements generated by up to 110 dwellings, and 160 dwellings once the Morpeth Northern Bypass is completed and opened for use. There were 10 objections to the scheme and Greystoke Surgery Patients Participation Group chairman John Walton raised concerns at the meeting. The group believes that improvements to the junction must be made before new homes are built as it is ‘an accident waiting to happen’. Applicant Linden Homes included a traffic lights system in its plans, but it has stated that it is willing to work with the county council, Morpeth Town Council and the Homes and Communities Agency (HCA) to install a roundabout junction. However, this requires the acquisition and disposal of allotment land, which is currently the subject of a separate application being considered by the Department for Communities and Local Government (DCLG), and provision of replacement allotment facilities on HCA land nearby, for which planning consent would also be sought separately. Some members of the planning committee felt that it was crucial to have the roundabout in place before work started, as this was the most desired solution, but Mark Ketley, a senior planning officer at the county council, said that the only deliverable option at present was traffic lights. He described it as a ‘cart before the horse scenario’ and said that the DCLG would be reluctant to dispose of the allotment land without the housing application permission being in place. Coun Heather Cairns added: “I think the county council has been put in a situation where they are not allowed to demand that this junction is made safer before construction traffic enters the site. 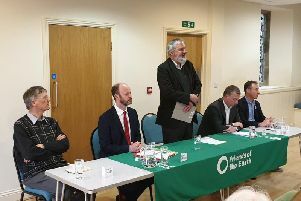 However, Coun Anthony Murray said that he believed that the construction of the Morpeth Northern Bypass would take away a lot of the pressure. The meeting also heard that a traffic management plan would be in place to assist the demolition work and this could include temporary traffic lights. Morpeth Town Council said in its response to the application that while it was minded to support the proposals in principal, ‘the only viable solution for this junction is the installation of a roundabout rather than traffic lights’.